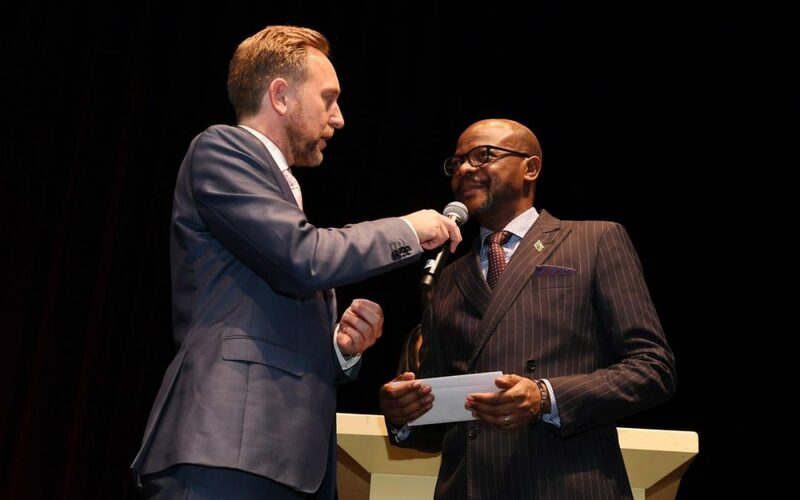 Zambia’s Ambassador to Germany, His Excellency Anthony Mukwita has won the 2019 Ambassador’s Award, an annual diplomat’s event organized by the Berlin-based Maritim Hotels in conjunction with the prestigious Diplomatic Magazine. The 2019 event brought together an estimated 300 guests that included 160 Berlin-based ambassadors accredited to the Federal Republic of Germany. The annual event has awards in various categories among them “The Ambassador’s Award” that appears the most coveted and prestigious. “While the prize is a night for two in the luxurious ambassador’s suite on the executive floor of the Maritim Hotels, our excitement with the award is the recognition of Zambia among the family of nations”, Ambassador Mukwita said. The Zambian ambassador said name-recognition is key to selling Zambia as a preferred destination for tourism and investment. Mr. Mukwita said since President Lungu changed the focus of foreign policy to economic diplomacy, his mission in Berlin has been and continues to employ every opportunity to sell the Zambian story. “Being mentioned at a function like this might appear simple and mundane for some people but for us, this is deep and significant”, the senior diplomat said, adding, “the more people hear the name Zambia, the more they are likely to seek out more information about who we are”. Zambia is covered on nine pages in the prestigious magazine that reaches more than a million readers apart from the cover picture detailing the reasons why investors should beat the business dreams onto the southern African country. Ambassador Mukwita said Zambians must understand that they have a good country, which is not good for her investment potential alone but for her values and her people. He said Zambia has challenges and a development backlog that government continues to address but the country has achieved so much so that the world is paying attention. The Berlin-based Diplomatic Magazine, a partner of the 2019 Diplomatic event has, for its February edition front cover page, featured Ambassador Mukwita’s portrait with the iconic Victoria Falls in the background. There are 160 Ambassadors stationed in Berlin and the Diplomatic Magazine Editors say while all envoys are important, there can only be one cover Ambassador and for the Month of February, the board felt Ambassador Mukwita would be suitable. Ambassador Mukwita presented his credentials to President Frank Walter Steinmeier in Berlin only on 15 November 2018 after his tour of duty in Sweden before President Edgar Lungu decided to send him to Europe’s largest economy. Zambia is the main story covered in the editorial commentary and 10 pages dedicated to the country, her people and the various investment opportunities on offer. The magazine was on display at the annual event and each guest took a copy. “And that is exactly why we share information in such publications – to reach as many people as we possibly can”, Ambassador Mukwita said.